To prevent a data breach or the misuse of sensitive information stored on your SQL Server, it’s not enough to simply fine-tune SQL Server database permissions and server instance permissions. You need to monitor access events to database objects (DBOs) and changes to schema, database, or server securables and stay on top of how database principles and server roles are being altered. For instance, if SQL Server user permissions for a table are changed from SELECT to ALTER or DELETE, or a user server role was changed from public to sysadmin, you need to quickly identify who made the change and when and where it happened in order to strengthen your SQL Server security and minimize the risk of data loss or privilege abuse. SQL Server privileges at the server level are assigned to logins and server roles, and at the database level, they are assigned to users and database roles. As a database administrator, you need to keep in mind that both levels of Microsoft SQL (MSSQL) permissions require your close attention. 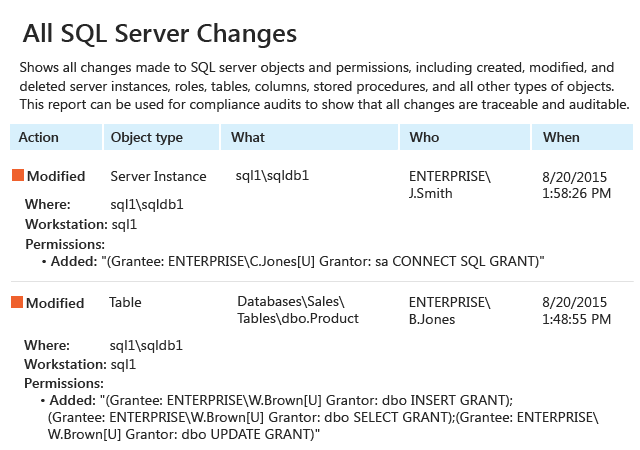 If someone makes critical changes to either server or database permissions in SQL Server, whether new rights such as DENY or REVOKE were granted to database roles or new principal ID permissions were added, it’s something you need to know about immediately. Native SQL Server tools such as Management Studio can help you keep an eye on what changes happen to permissions. However, you need a deep knowledge of Transact-SQL in order to create unique queries, and you’ll spend a great deal of time and effort crawling through data to find the exact answers to your questions. On top of that, native tools lack easy-to-read reports and provide no ability to subscribe to any reports — always leaving the risk that a critical change may go unnoticed. By taking control over Windows-based SQL Server permissions, you can reduce the risk of data loss and shield your critical assets from being compromised. Netwrix Auditor for SQL Server brings visibility to changes and access events across all of your SQL servers. The solution also helps you slash the time you must spend to spot unauthorized changes to your SQL Server permissions list, including changes to server and SQL Database permissions, by providing insightful reports you can easily subscribe to and get on the schedule you specify. The actionable reports show critical details, such as who made a change and when and from which workstation it was made, as well as the before and after values of every modification. The Interactive Search feature enables you to quickly pinpoint the culprit and determine, for instance, which SQL user permissions were changed and how they were used, thus saving you from the tedious manual review of native traces and scatter information. Plus, Netwrix Auditor retains your audit data in a cost-effective two-tiered (file-based + SQL database) storage for later review.